The Holiday season is usually stressful and busy. It’s also a time when we bring more into our homes than we remove, leaving us feeling overwhelmed and frustrated. This Holiday Season I’m having a Holiday Declutter Challenge. The goal is to simplify your home and life for the holidays and to go into the new year with a more peaceful and clutter-free living space. 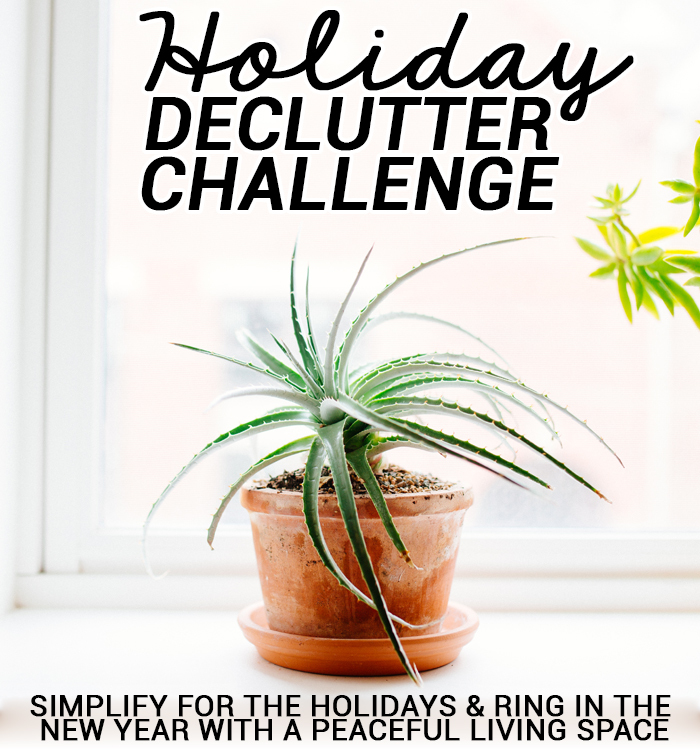 The Holiday Declutter Challenge will be running from November 1st through December 31st! I challenge you to join me in trying to rid your home of 200 items. That number sounds big, but that is just about 22 items each week. To keep on track with the challenge I will post a place to focus on Saturday of each week for the week ahead. In terms of this challenge a week will be Saturday – Friday so that each weekend is grouped together. Spend as much or as little time on this challenge each week, but remember – the less you have in your home to manage the more time and peace of mind you’ll gain. My personal goal is to spend a minimum of one hour on each area each week and get rid of at least 22 items. This is the stuff you’ve meant to fix, sell, donate, give away or toss for as long as you can remember. Off the top of my head is a curling iron that hasn’t worked in years, a couple of dresses I’ve meant to fix, etc. It’s a great head start because these are already in the back of your mind bugging you. Take a tour of your house with a box or bag and go through the closets, the drawers, the boxes, etc. and pull out the items that you’ve been meaning to do something with. If there’s something you need to take somewhere to get fixed take it there this week or get rid of it. The items you’ve been meaning to sell? Sell them! Been meaning to donate? Donate them! Been meaning to toss? Toss it! Take action on all these items that you’ve been telling yourself you’ll get to “eventually”. Get them out of your house and off your mind. I’ll be back Saturday, November 8th with an update on my progress this week and the new area to focus on next week. I hope you’ll join me for this Holiday Declutter Challenege! I’d love to hear from you in the comments if you’re joining in and feel free to use the image above if you decide to blog about it, all I ask is you link back and spread the word. Would you like to join me? Do you have any Lingering Stuff in mind that you need to take action on?